The SPRINGTEST T1 series is a very simple and economical system for checking compression springs in one point. The force gauge gives the force applied, the displacement sensor on the side shows the flexion or height measured under load. With its revolving hand crank, it is designed to perform tests from low capacity (10N) to high capacity (2.000N) with quick results. For measurements over 1 kN or if you need a separate display, the test stand TEX555R can be equipped with an external load cell. It is compatible with all the force gauge of the product range Centor. The manual test stand features a small footprint, durable design, portable and a digital travel display. Combined with our Centor force gauges, the Springtest T1 can measure any compression spring in production or laboratory for an affordable price. 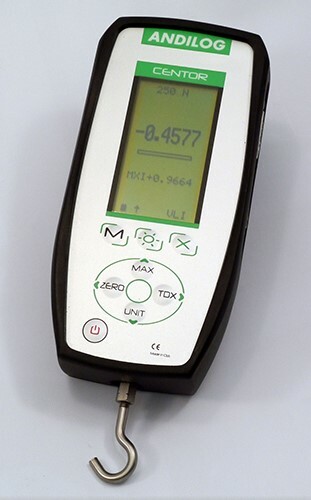 The force gauge Centor Easy is designed to meet the production needs of its users and offers indispensable feature for quality controls, such as: ease of reading with its large backlit graphical display, internal memory of the last 100 values, RS232 output and ability to set thresholds with visual and sound alarms. The M5 thread at the back of the device enables the mounting on the Springtest T1. This self-leveling compression platen adjusts the parallelism between the plate and the sample holder during measurements in compression. It can be used to test a large range of materials and particularly recommended when testing compression springs. With its locking screws, it enables to fix in position and ensures the parallelism with the compression platen during the measurement for a correct seating for the spring. The diameter of the self-leveling plate is 76 mm and it is suitable for tests up to 2.000 N.
For the first measurement and regularly, it is necessary to ensure the parallelism between the compression platen and the self-leveling plate. Unlock the screws of the self-leveling plate and put the two platens in contact. In order to reach the optimal precision of the Springtest T1 and to compensate the mechanical deformation of the system, we recommend applying the maximal force of your force gauge on the test stand. Once you have done this, tighten the screws of the leveling plate and tare the digital ruler. 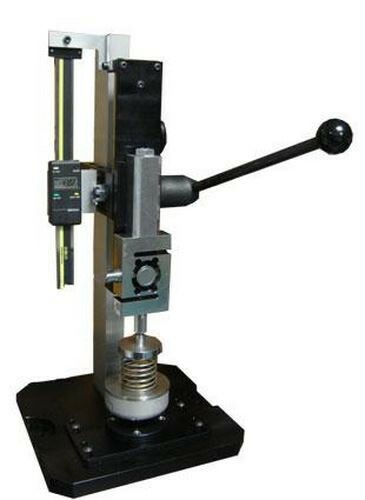 This way you can test with great precision and lower deformation all of your springs. Place your springs on the Springtest T1, tare the force gauge and go down with the measuring head until you´ve reached the expected compression height and record the actual force indicated on the Centor Easy. 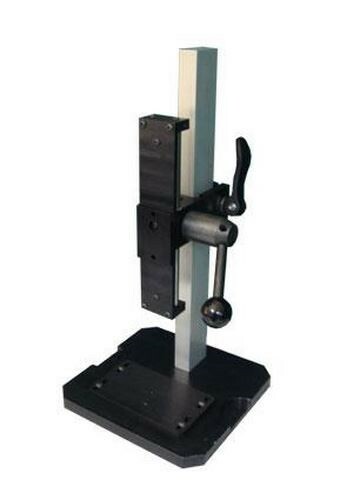 Mounted with a digital ruler, the TEX 555R test stand is ideal for low and medium force testing when a quick result is required on force and deflection.